POPE John Paul II has made an unprecedented apology for the sins of Christians through the ages, the culmination of the Church’s “examination of conscience” for the Jubilee Year. The Pope’s long-awaited “mea culpa” on March 12 was echoed by local Churches elsewhere and generally welcomed by non-Catholics around the world. 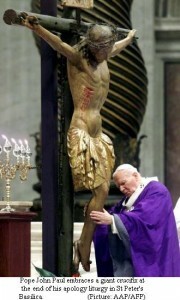 During a Lenten Mass in St Peter’s Basilica, rich with symbols of penitence, Pope John Paul II solemnly asked forgiveness for the past and present sins of Christians.